Kilmarnock manager Gary Locke reckons he might not be able to make any January signings unless he offloads some players first. The Rugby Park side started 2016 positively with a spirited 2-2 draw at home to Hearts but have new injury worries to contend with as well. Tope Obadeyi limped off with a hamstring injury, while Mark O'Hara went over on his ankle on Friday. "The budget is spent at the moment," Locke told BBC Scotland. "I think I'm going to have to try and get a couple of players to maybe move on to bring people in. "We're well aware of the financial situation at the club - we haven't got a lot of money. "But I definitely do think we need to strengthen the squad, so we'll try our best to do so." O'Hara will have his ankle scanned on Monday and the extent of Obadeyi's hamstring injury will be assessed by the club's physio. "We showed a lot of character to come back and it's a good way to start the year," said Locke. "But we've got to show that commitment and passion every week. "We've shown the teams at the top of the league that we can match them and we've now got to do that against the teams round about us." Hearts head coach Robbie Neilson believed the result in Ayrshire was a missed opportunity to apply some pressure on second-placed Aberdeen. 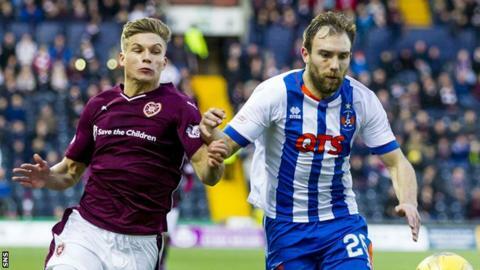 "I'm really disappointed we didn't pick up three points here," Neilson told BBC Scotland. "There was a period when we went 2-1 up that we should have killed the game and then we let them back in it with a poor defensive display at a corner. "We should be coming down here and winning. It was a bad first goal and a bad second goal. "Where you're sitting in third place in the league you should be going to the team at second bottom and winning." Neilson revealed after the game that one additional striker is all he would possibly consider bringing to the club in January. He acknowledged that Killie played "decent football" at times and said: "When they play against a team like Hearts, there's no pressure. "The pressure comes when they play the likes of Dundee United and Partick Thistle at the bottom of the league where it's a real six pointer." Neilson felt referee Alan Muir made the wrong call in not giving a penalty when Juanma was brought down in the box by a combination of Kevin McHattie and Lee Ashcroft during the first half. "There was one or two things that I've no idea what he was thinking when he made the decision," added the Hearts boss, who thought that Juwon Oshaniwa was fouled as Kilmarnock scored their first goal.